Your priority is protecting yourself and your assets. Most people do this by obtaining homeowners insurance and auto insurance. Unfortunately, these coverages may not be enough to protect you if you’re involved in an accident. The best way to get through life is to expect the unexpected. Accidents can put a damper on your life and cause serious financial problems. The easiest way to protect you and your family from the financial impact of an accident is to buy a Personal Umbrella Policy or PUP. A Personal Umbrella Policy is extra insurance against liability. It protects you or members of your household if you cause harm to another person or their property. Umbrella policies are purchased in addition to home, auto or boat insurance. They cover things like legal fees or settlement costs after your other policy limits have been reached. What Exactly do PUPs Cover? 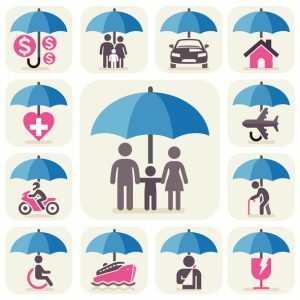 Personal Injury – If you or a member of your family cause physical injury to another person, your umbrella policy will help cover the medical expenses. This is true regardless of when, where or why the injury occurred. This includes car accidents, attractive nuisances (swimming pools, playground equipment, etc. ), and injuries incurred on your property. Property Damage – If you damage someone else’s property, your PUP will cover the cost of the damages and repairs. Whether you total someone’s car, drive your car through a wall, or your kid accidentally damages school property, you’re covered. Off-Premises Accidents – This covers you if you cause an injury to someone while not on your own property. The most common example would be if you are walking your dog and it bites someone on the street. In this scenario, your PUP would kick in and pay for that person’s expenses. Property Owners – Whether business or residential, if you own a rental property, a personal umbrella policy is a must. It can protect you if someone is injured on your property or if one tenant injuries another. Lawsuits Against You –Personal umbrella policies can provide financial assistance with legal fees if you need to defend yourself against slander, libel, false arrest, wrongful evection, defamation or malicious prosecution. Business Activities/Losses – Whether your business is brick and mortar or run out of your own home, someone injured while conducting business with you will not be covered by a basic PUP. That said, you can purchase what is known as a “rider,” which will add specialized coverage to your policy. Expected or Intended Damages – If you intentionally harmed someone or damaged their property, your PUP is not going to cover those costs. Damage to Your Personal Property – Personal umbrella policies cover you if you damage someone else’s property, but not if you damage your own property. If you break a window or put a hole in the wall, you have to pay for the damages out of your own pocket. You could also see if your homeowner’s or renter’s insurance covers them. Exotic Vehicle Liability – Cars, boats, and golf carts are usually covered by umbrella policies, but there are certain vehicles that aren’t. For example, if injuries are the result of a plane or jet ski, you could be responsible for paying for the damages. The types of vehicles not covered may vary, so check your policy for specific details. Hired Help – If someone has been hired to work on your property, they may not be covered by a PUP. Occasional workers, like a babysitter, should be covered as long as they work less than 35 hours a week. But if the worker is full-time, you may require a special “rider” to cover accidents or injuries. How Can a Personal Umbrella Policy Benefit Me? Could you deal with these things on your own? Yes, but it could be difficult. Would it be easier to have a policy that helps with the unexpected things in life? Absolutely. People tend to be sue happy, and the injured person could use that accident as an opportunity to take you for all you’re worth. It can provide peace of mind. One thing that is stressful as an adult is thinking about all of the “what ifs.” Umbrella insurance covers a lot of those and gives you the opportunity to not worry as much. Personal umbrella policies are affordable. Many companies can help you set a $1 million policy for as little as $12 to $16 a month. At that price, it really can’t hurt. It’s like getting disability insurance through your employer; you may never have to use it but if you do, you’ll be glad you did. A personal umbrella policy is a good thing for any individual to consider. Unfortunately, not only do most people not carry a PUP, they carry very little insurance other than the legally required minimum. If you are injured by someone who doesn’t have umbrella insurance, it may be hard for you to get compensation for your injuries and damages. The personal injury attorneys at the Frickey Law Firm are here to make sure you are fairly compensated, no matter how the accident occurred. If you’ve been the victim of someone else negligence, contact us to schedule a free consultation and find out what your case may be worth at 303-237-7373.